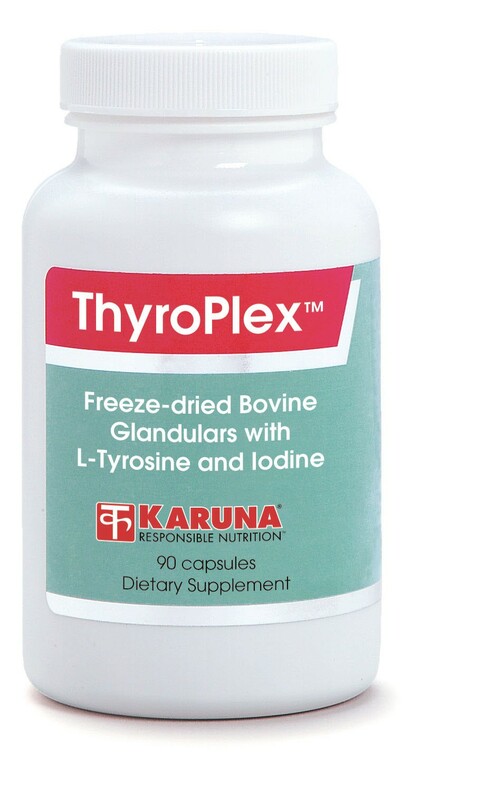 ThyroPlex provides freeze-dried, BSE-free, glandular tissues from thyroid, anterior pituitary, and hypothalamus. L-tyrosine is a precursor of thyroglobulin which, when iodinated, produces thyroxine and other thyroid hormones. 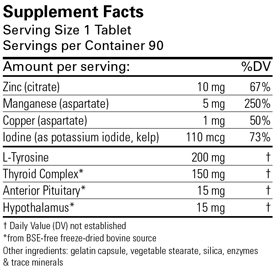 Thyroid hormone production is the sole purpose of iodine in human nutrition. Suboptimal dietary intakes of zinc, copper, or manganese can adversely affect thyroid hormone metabolism. Suggested use for adults: 1-2 capsules daily, or as directed. Should be taken 20 minutes before or 1 1/2 hours after a meal. NOTE: This product does not supply thyroid hormones.